Edward Jenner was born at his father's vicarage at Berkeley, Gloucestershire, England, on May 17, 1749. After leaving school, he was apprenticed to a local surgeon, and in 1770 he went to London and became a resident pupil under the great surgeon and anatomist, John Hunter, with whom he remained on intimate terms for the rest of Hunter's life. In 1773 he took up practise at Berkeley, where, except for numerous visits to London, he spent the rest of his life. He died of apoplexy on January 26, 1823. Jenner's scientific interests were varied, but the importance of his work in vaccination has overshadowed his other results. 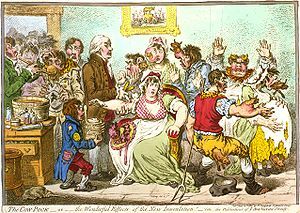 Early in his career he had begun to observe the phenomena of cowpox, a disease common in the rural parts of the western counties of England, and he was familiar with the belief, current among the peasantry, that a person who had suffered from the cowpox could not take smallpox. Finally, in 1796, he made his first experiment in vaccination, inoculating a boy of eight with cowpox, and, after his recovery, with smallpox; with the result that the boy did not take the latter disease. Jenner's first paper on his discovery was never printed; but in 1798 appeared the first of the following treatises. Its reception by the medical profession was highly discouraging; but progress began when Cline, the surgeon of St. Thomas' Hospital, used the treatment with success. Jenner continued his investigations, publishing his results from time to time, and gradually gaining recognition; though opposition to his theory and practise was at first vehement, and has never entirely disappeared. In 1802, Parliament voted him 10,000, pounds and in 1806, 20,000, pounds in recognition of the value of his services, and the sacrifices they had entailed. As early as 1807, Bavaria made vaccination compulsory; and since that date most of the European governments have officially encouraged or compelled the practise; and smallpox has ceased to be the almost universal scourge it was before Jenner's discovery. "The Cow Pock or the Wonderful Effects of the New Inoculation!"